What is Ayuwage, Is Ayuwage a Scam or Legit? AyuWage has been online since 2010. AyuWage is paid to click site in which you can earn money by viewing sites, doing survey and completing offers. In AyuWage, You can earn money by viewing sites. Usually, You need to view site for 20 seconds and you can earn 2-12 credits per site. You will also find the regular ad section in which you have to view the site for 10 seconds and after that, you need to click on at least one advertisement. In this section, you can earn 10- 60 credits per site. 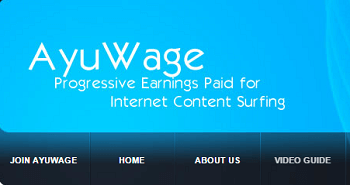 AyuWage provides other earning features like searching something on google, Email, Explore, special e.t.c. Follow the instructions that are provided there to complete the task and you can earn 15 to 400 credits. You can earn 500-4000 credits per survey you complete. You must follow the instructions to complete the survey. When your work is approved by the third party you will be get credited within 24 hours. Listen radio and earn 3-10 credits for every 10-30 minutes of listening. You need to enter captcha for every 10-30 minutes to verify that you are still listening. Referrals are the great way to earn more money in Ayuwage. There is no limit on direct referral so you can refer a lot of people and earn good commisions from them. You will get 10% from your referrals click. So try to get more direct referrals to increase your earning. The minimum cash out is $5(10000 credits) for Paypal and $5(11500 credits, 15% fees included) and it will not increase after each cashout. The first cashout will take 5-7 days to complete after that it will take 1-2 days to complete the request. AyuWage is a legit site and paying more than 5 years without any major issue. There is unlimited direct referrals program exist, So it is a good opportunity for those who can get a good number of referrals. The minimum cash out is only $5 which is fixed. Ayuwage does clicking fraud. They have an earning section named Regular ads. In this section you need to view the site for some seconds after that you must click on at least one advertisement that interests you. You will not get credited if you do not click on advertisements. There is a warning system exists in AyuWage, If you have more than three warnings your account will be permanently suspended. They also provide the renting referrals feature, which is not a good way to earn money. Rented referrals don’t work after a few days and you will lose the money which you invested in rented referrals. So try to make direct referrals instead of investing in renting referrals. AyuWage is a legit site and paying more than 5 years to its members. This site is best for USA members, USA members will get a good number of ads. By just viewing ads, they can earn good money. For other countries members, They will not earn good money by viewing ads. But they can make a good income by referring others to this site because there is no restriction on direct referrals. Want to Build an Online Business? Check out #1 Program here! AYU has turned into a total sham. They were taking so long to pay that many ended with very large balances. My friend requested at $10.00 and the request sat for a long time during which she made another $16.00. After nearly two months they simply deleted the $10.00 request but the money was never returned to her account. She is now out over $26.00. I have been paid several times and I currently have a $10.00 request in but do not expect to be paid. Ayu has been on a downward spiral for the past year and seems to have reached the bottom. They do not respond to support requests but that is not a new thing. They have never replied since I first joined. I have no warnings and have had no issues of any kind. I will not be working the site until payments become current and I do not expect that to happen. Good luck to everyone. I truly wish I were more hopeful. Ayuwage is a scam . They dont like paying when someone earn more than 5 $ just kick him off . They get people,s earnings , refferals . Suspending accounts is just every day action .